LIFTING SPIRITS! ELEVATING ENERGY! OPENING HEARTS! 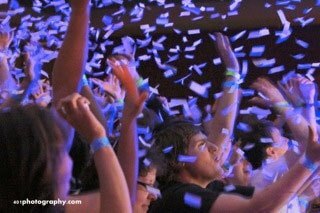 Flutter FETTI® church confetti products will enliven and uplift your church congregation with excitement! Amaze your flock with bursts of Flutter FETTI® church confetti exploding in the air. In order to attract new members - younger congregants in particular - many churches have enhanced their programming by adding theater, spirited choirs, bands, and many artistic touches. Flutter FETTI® is a wonderful church celebration decoration tool in this new world of worship. It sends the energy level at any church service or celebration sky high. Ways of taking it to a new level with Flutter Fetti® church confetti products are endless! Flutter FETTI® church celebration decorations can be dropped from the ceiling at the end of an inspirational sermon. Choir members have hidden Flutter FETTI®'s 6" Flutter Flickers® and our 14" Confetti sticks in their robes and surprised their audience with clouds of colorful confetti at the joyful climax of a song. Use it as white snow in a Christmas pageant. Flutter FETTI® church celebration decorations also create a festive atmosphere at bake sales, church picnics, and fairs. 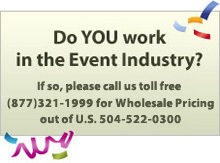 Our confetti has been especially designed for easy clean up, and there is no minimum order. Die Cut Tissue Stars by the Pound - 2"